Like most, I enjoy a good avocado. No, not that mashed up brownish guck they slop on your sandwich and charge $3 extra for at your local café. I’m talking about a perfectly ripe, silky smooth, bruise free avocado. I’m talking about flesh so soft that all you need is a dull spoon to scoop out a bite of heaven. Flesh so buttery that it practically melts in your mouth the moment it hits your tongue. But, if you’re an avocado enthusiast like myself, and I think it’s pretty clear I’m the queen of enthusiasm here, you know a thing or two about not-so-perfect avocados. If you’re like me, you know, all too well, the inglorious realization that occurs when each and every avocado in the grocery store is as hard as your imitation granite countertop. Maybe you had big plans for spontaneous guacamole or maybe you were just looking for a good time. You think, “This one is good enough,” as you grasp firmly around the less-than-ripe fruit and plop it into your basket, where it lands with a discouraging thump. When you arrive home, you retire the avocado to the fruit basket, putting off dinner just one more hour because maybe, just maybe, some sort of magical transformation will occur and that dear avocado of yours will ripen at the speed of light. But alas, as you wantonly cut into its impenetrable flesh, you realize, defeated, that you’ve been played, gotten, even swindled by your own lack of patience, resolving that your guacamole, omelet, salad, what have you, will have to settle for mediocre. You see, the temperamental nature of avocados is what makes them so sought after, so enticingly coveted. With avocados, we’re always chasing a high. We remember, with ardent clarity, that one avocado which emanated perfection, provoked us at our most vulnerable state, and we were never the same. For me, this avocado was grown in the South of France. While admiring the vibrant produce in Nice’s flower market along the Cours Saleya, I happened upon this little creature, about the size of a toddler’s fist and as ripe as the springtime air. It was so adorable and precious, resting atop a clumsy pile of its inadequate counterparts, and I had to have it. I think the farmer saw that glimmer in my eye, maybe akin to his first encounter with a perfect avocado, and he gave it to me for ten Euro cents. It was the most delicious food I’ve ever eaten. Perfectly ripe and abundant in flavor, it was a luxurious and self-indulgent experience that lasted all of one minute, before the tiny thing was nothing more than a shell, gone forever to taunt me into eternity. Taunt me as it may, I’ve been in an everlasting pursuit to find another perfect avocado. There have been contenders, but none compare to that one wonderful Niçoise avocado. Short of packing my bags and moving to coastal France, I’ve sought to create the perfect avocado with my bare hands. Cue, the egg. Eggs are wonderful, I’ll be the first to say it. Put ‘em on a sandwich, a salad, a pile o’ bacon, pretty much anything, and you’ve got yourself a to-die-for meal. My personal favorite (until now) was the egg-in-a-hole, a holy (literally) trifecta of bread, butter, and egg wherein a circle is extracted from the center of the bread slice and filled with an ooey, gooey egg and fried to perfection. I could eat egg-in-a-holes day in and day out, but something tells me my petite physique wouldn't last too long on such a diet. Coincidentally, it just so happens that avocados are the perfect vessel in which to place an egg, and in a most fortuitous manner, when combined, the two enhance each other’s best attributes, of which there are many. Who knew that the next best thing to a fresh-off-the-farm avocado was a baked avocado! Think back to that first avocado with which you fell in love. Now imagine that same refreshing flavor, but warm and eggy. That velvety texture you recall is nothing compared to this, smooth as the velvet curtains of the Chateau de Versailles. This reimagined avocado is luxury at its finest, so decadent that it might collapse if not for the crispy on top, soft in the center egg that keeps everything together. And, if rich avocado and creamy eggs aren't enough for you, the goat cheese at the bottom is a buried treasure not to be forgotten. Hungry yet? This newfangled egg-in-a-hole might just become a part of your morning routine, should you, by happenstance, come across that perfectly ripe avocado in the pile next time you go shopping. If you aren’t so fortunate, and all too often we are not, grab a couple firm ones and don’t let your impatience get the best of you. In a few days, you’ll be glad you waited. 1. Preheat oven to 450o F.
2. 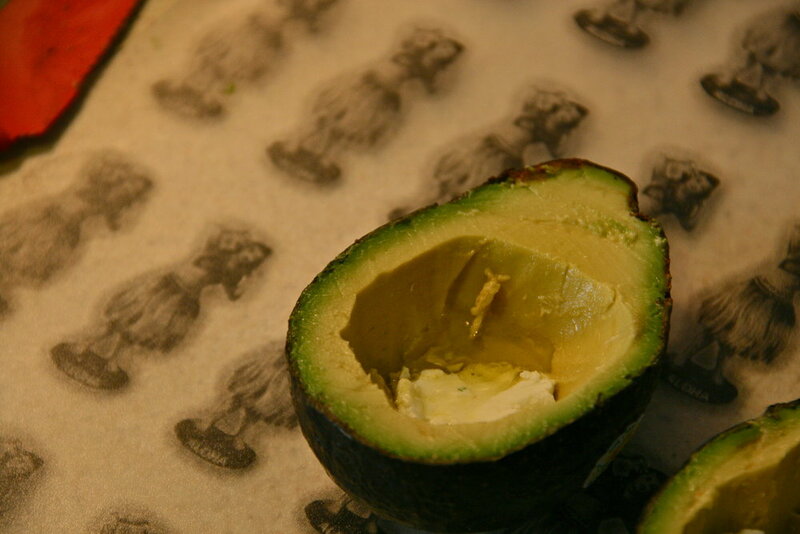 Slice avocado in half and remove pit. 3. Using a spoon, trace the now empty space where the pit was, making the hole larger by about 50%. 5. Place one tablespoon of goat cheese into the bottom of each half, gently pressing so that it is flush with avocado edge. Drizzle half a tablespoon of olive oil into each half. 6. Crack one egg into each half. Careful, the whites may pour out a bit, depending on the size of the hole you made. 8. Bake for 20-25 minutes, depending on how runny you want your yolks. 9. Remove from oven and garnish with fresh chives. Serve immediately.